You Are Here: Home → Should You Stash Your Supplies On Your Property? Should You Stash Your Supplies On Your Property? A fundamental part of prepping is, surprise!, being prepared. Now, being prepared means having skills mastered (or at least to a usable level) and a plan, but it also includes having supplies on hand for when a disaster situation happens. Why? Because you can have all the skills and abilities in the world, but, if you don’t have the materials that you need to use for those skills or the food to carry you through until you can hunt, gather, or grow more food, you won’t survive to get to a point to put those skills to work. Needless to say, having supplies available is important. 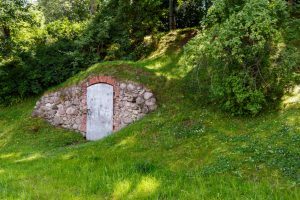 So, that gives us some considerations on where to put our stash, but Isabelle Z also specifically suggests that you consider corners of your yard, near septic tanks (or, I would add, a well house), or “underneath something unexpected” such as a fountain or gazebo. These are all great suggestions, and the thing to keep in mind when selecting your location is to consider how private and secret that location is and can be kept. You want to make sure that your stash remains your stash and doesn’t become the neighborhood’s stockpile without your permission. So, yes, it can be a very good idea to have a supply stash on your property, just keep in mind the secrecy factor. Your stash will NOT be YOUR stash if others’ know about it! !